Favorite Smash Brothers Brawl Characters? What are your favorite Smash Brothers Brawl Characters? I generally subscribe to the cute=deadly theory. Hey Pat! I don't have any favorite characters yet, but I'll post them when I figure them all out. For now, I'll just say I like playing as Link with the blue Nausicaa-like outfit. The people I tend to use most often, however, are Ike, Sonic, Diddy, Lucas, and Metaknight. The old characters are still great as well. Across all three games I would have to place Kirby as my all-time favorite character, with Link and Samus tied in second. 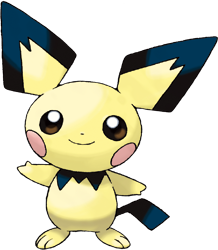 Why did they have to cut Pichu? ... and tell it to go away forever? For me it's a tie between Lucas and Sonic. If I can't beat somebody with Lucas, I can usually do it with Sonic...and if not then I get really desperate and start playing as other characters until I can find something that works (which usually comes in the guise of Olimar, Captain Falcon or Fox). I have the most fun with Lucas because I actually chant out the raging death that is PKStarstorm, then proceed to cackle like José Von Reichter. I still would have chosen to play as his adorable corpse; they should have left it in. I'm liking MetaKnight right now. His jumps really bail me out of some bad situations and his sword-freakout noise is hilarious. I can tell it annoys anyone who gets caught being slashed by him. Heheh. A good metaknight player can really clean up, and I always feel so stupid if I get caught in his final smash. He doesn't have that many smash attacks, but it doesn't really matter the way that he racks up damage %. I've found that his moves sometimes lack a good recovery though so I tend to take advantage of him at those times and give him a good 'ol baseball bat to the head. Also, his voice work is hilariously deep for the little bugger. So wait...zombie Pichu then Michael? Meh, maybe in the next game. You can always just pull out Melee every so often to play as him again. 5. I don't know... Olimar?